If you wish to race your buddies on their Carrera layout with a chance to beat them in the stock class, you will need one of these new TSR RTR cars, CLICK HERE. Your friends will have a tough time keeping up with you! 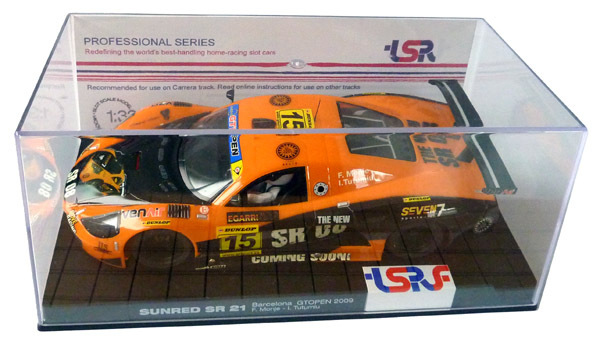 Available in 3 different color schemes, the Sunred SR12 GTR is a Spanish-built GT car racing in a European series. TSR offers this attractive GT car in 3 different color schemes, fitted with the race-tuned TSR chassis. The ultra lightweight injected body compares favorably with a lightweight vacuum formed body while offering superior detail. Its on-track performance out of the box will amaze you. Get your own from Electric Dreams or CLICK HERE. Very glad to see some new products from TSR. Any plans for a "white body" version of the Sunred? They are... you will have them in time for the Checkpoint. Where can one purchase those beauties at or from???? Send me one and I will try it out? If it pass my test its the bomb. The main competition for the TSR are the NSR cars, supposedly the fastest home-racing 1/32 scale cars out there. Well, when Electric Dreams organized a competition last year for modified Fly cars, a stock Fly Porsche, a stock NSR Ford MK4 and a stock TSR Porsche 956 were used as performance-comparison vehicles. 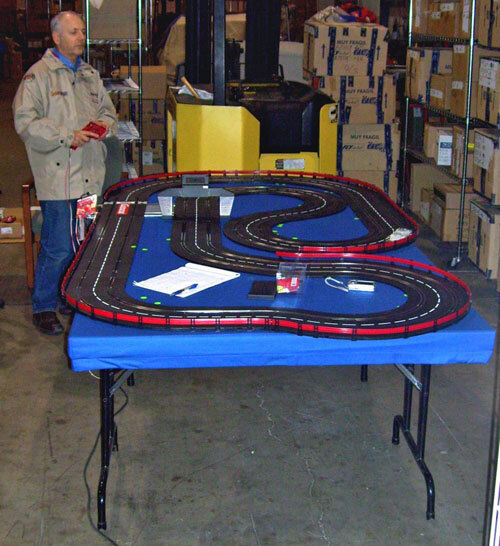 The cars were taken out of their boxes and placed on the 4' x 8' Carrera layout used for the competition. Nothing was done to the cars, not even lubricating the axles or the motors. The laps were achieved in 5-minute segments automatically timed. We have repeated such comparisons all over clubs, raceways and private homes. The customers know which is their fastest, best-handling stock home-racing car in their stable. OK very nice, what type of tires where used? Also looking at the chart, the Mag force where absolutely a advantage to TSRF, 440? How about the motors, what power range did the Fly come with, and the rest of the field of the cars? Nesta, 100% stock cars out of the box. Stock Carrera power supply. So how and why would anything else matter? Hey Dokk I like the body.... can I get one for my TSR 1/32 car? You guys play dirty! I got one of your chassis also. It's all a question of bribery...but TSR will be selling some Slot.It Porsche 956 bodies soon. I got a body mounted on your chassis and its a Slot.it Porsche, just wanted to make sure that you are not sucking up to anyone! Merry Christmas to you and your lovely wife.